Murray Joseph “Joe” Leonard was born on Christmas Day of 1924 in Hedley, Texas and passed away peacefully in Houston, Texas at the Houston Hospice on April 3, 2019 at the age of 94. Joe embodied the Greatest Generation: he was a decorated war hero, educator, mentor, gentleman, and friend. Joe was born the fourth child of Walter Murray Leonard and Ruth Gilbreath Leonard. He was raised in Cleburne, Texas with his five siblings and graduated from Cleburne High School in 1942 while the world was at war. Without hesitation, Joe enlisted in the United States Army as a Combat Infantryman in May of 1943 at the tender age of 18. He waved goodbye to his family (an event Joe would recall to be heartbreaking) and boarded a troop train headed west for basic training in San Luis Obispo, California. After training, Joe deployed overseas to Lahar, France and served with the 387th Infantry Regiment on the battle front at the Rhine River where he supervised sixteen men and one light mortar. He was wounded by shrapnel during the battle of the Ruhr Pocket on April 7, 1945. After the war, Joe returned home and, thanks to the G.I. Bill, earned a B.S. in Education from Texas Christian University and a M.A. from Texas Weslayan College. He also met a young student at John Tarleton College named Jeann Dennis from Stephenville, Texas. Joe and Jeann married on August 21, 1947 and would celebrate 64 years of marriage. Joe and Jeann started a family and moved to the oilfield town of Electra, Texas where Joe began his lifelong career in education, starting as a schoolteacher. Joe was soon promoted to junior high principal. In 1954, Joe was recruited by the Liberty Independent School District (LISD) to serve as Principal of Liberty High School. Joe and Jeann would call Liberty home for their rest of their lives. 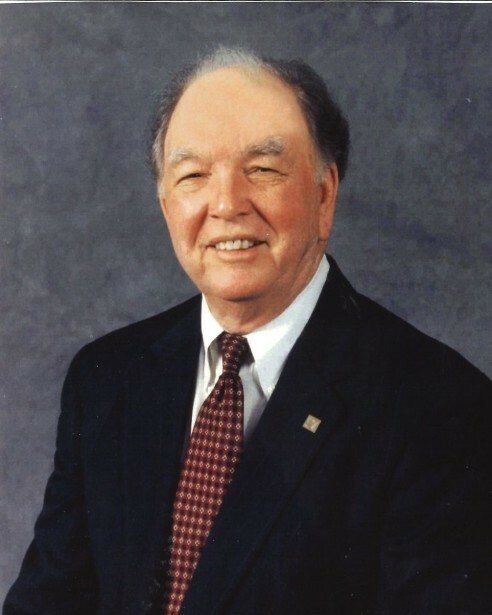 After serving a few years as principal, Joe was promoted to the Superintendent of LISD in 1960, a position he held until his retirement in 1980. During his career with LISD, among many other accomplishments, Joe oversaw the racial integration of Liberty’s schools, managed the construction of new educational facilities (including the current high school in 1979), celebrated UIL championships in Track and Field in 1964 and 1965, and traveled to New York City to promote LISD in the public bond markets. As many will testify, Joe developed life-long relationships with his colleagues and students, and his sharp memory of them (and their family and specific accomplishments while in high school) was a precursor to the modern-day Facebook. Joe stayed active following his retirement from LISD. He was hired by the First Liberty National Bank as a Marketing Officer and remained involved in education through his service on the Board of Trustees at the Region 4 Education Service Center. Joe became “Papa Joe” in March of 1986 when his only grandchild David was born in Houston. Joe could also be spotted in Liberty taking a morning walk with his AM radio headphones, watching Jeopardy, enjoying a meal with Jeann, attending worship services at the Liberty Church of Christ, or traveling with Jeann to Houston to cheer David in athletic competitions. Indeed, Joe was an avid fan of high school, collegiate, and professional sports, most especially the Texas Longhorns, and had a legendary memory of games and statistics. Joe also enjoyed traveling during retirement. Joe and Jeann celebrated their 50th wedding anniversary with friends and family in Ruidoso, New Mexico. Joe and Jeann also took road trips with David, including trips to the Pacific Northwest, New England, Washington, D.C., and the Rocky Mountains. Joe enjoyed road trips until the end, and was always eager to take a spin through Liberty County to catch some fresh air and maybe a Blizzard from Dairy Queen. Joe is preceded in death by his beloved wife, Jeann, his most ardent cheerleader in life for 64 years; his parents Walter and Ruth Leonard, his brothers Bill Leonard, Cliff Leonard, Claude Leonard and sisters Pauline Webb and Alene Burns. He is survived by daughter Jana Tucker and husband George of Midland; son Michael Leonard and wife Colette; only grandchild and absolute joy of his life David Leonard and wife Kelly, great-grandson David Michael "Dee" Leonard III and Richard Barry Leonard due in June of 2019, all of Houston. Joe is also survived by numerous nieces and nephews whom he adored. Friends are cordially invited to gather with the family and share remembrances of Joe during a reception to be held from five o’clock in the afternoon until seven o’clock in the evening Friday, the 12th of April, at Allison Funeral Home, 1101 North Travis, Liberty, Texas. The memorial service will begin at one o’clock in the afternoon on Saturday, the 13th of April, at Liberty Church of Christ, 3201 North Main, Liberty, Texas. Burial will be at Cooke Cemetery, 1906 Lakeland Drive, Liberty, Texas. Honorary pallbearers will be Jay Arnold, Dr. Jerry Barber, Rusty Blair, Dr. Reese Brown, Frank Neal Griffin, Dr. Hugh Hayes, David Michael Leonard, Jr., David Mearns, Ray Milenz, Dennis Odell, Carl Pickett, Ed Pickett, Sheriff Bobby Rader, Randy Schulz, Mike Smith, Judge Don Taylor, and Alan Waldrop. As Joe would say, “blessings shared are not divided but multiplied.” So, in lieu of customary remembrances, the family requests memorial contributions be directed to the Liberty ISD Education Foundation, attention M.J. “Joe” Leonard Endowment, P.O. Box 10437, Liberty, Texas 77575 or the Liberty Church of Christ, 3201 N. Main St, Liberty, Texas.